New Drawings by Jess Ruliffson: Roadshow! Skummi and Co. are really taking off with some amazing summer shows. Be sure to check this one out, it's a two-night event. I'll be there Saturday night. 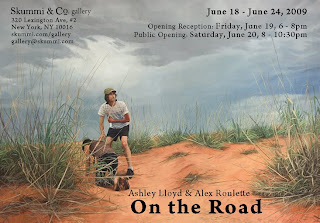 You are cordially invited to join us at our opening reception and public opening of our new show "On the Road" featuring Ashley Lloyd & Alex Roulette. Photos of the exhibition are here. We hope to see you there and enjoy the rest of your week.